There is loads to look forward to on the Devonshire food and music festival calendar, with exciting bands and top chefs already confirmed. It’s the biggest festival of its kind in the UK and attracts gin lovers in their thousands, all with a shared passion for this extraordinary liquor. At Torquay Gin Festival you’ll discover gins from all over the world and get to speak to the distillers who craft them. You’ll also be able learn some of the secrets behind the perfect serve. Thousands flock to The Exeter Food & Drink Festival to enjoy the very best of the West Country’s food and drink. Held in the courtyard of Exeter Castle, watch live cooking demonstrations or roll up your sleeves and have a go yourself during one of the various workshops. The festival runs along side Exeter Beats (4th – 6th May) where you can enjoy live music into the night, street food stalls and a festival bar. It’s a celebration of historic Salcombe’s fishing and tourism, where the brown crab – hauled up by the Salcombe fleet and considered to be the best in the world – takes centre stage. Enjoy a ‘vibrant showcase’ of the town’s finest food and drink at the Salcombe Crab Festival. More than one hundred performances at twenty venues over a packed three days – Dart Music Fest is back with one of the most diverse and exciting line-ups on the West Country festival calendar. There’s more musical genres than you could shake a drumstick at! ‘Stop Press’….This year’s headline act will be ‘Dodgy’ best known for their 90s smash hit ‘Good Enough’. Clovelly Seaweed Festival is a celebration of seaweed and all of its immense health and nutritional benefits. In homage to this awesome algae, Clovelly’s Quay Kitchens will be serving a variety of dishes, plus stalls will be selling a range of seaweed products. They’ll also be live music, craft activities and workshops, talks and demonstrations, and street entertainment. This thriving North Devon village also hosts a herring festival during the month of November in celebration on those ‘silver darlings’ of the sea. A popular annual event, the Exmouth Festival gravitates around community arts and is full of live music, arts and crafts, children’s activities, food and drinks stalls, circus skills, arts trails, all the fun of the fairground, and a late night bar. The Ottery St Mary Food & Family Festival is a community-led event where local food producers and chefs take centre stage. Expect a friendly welcome at this wonderful advert for Devonshire fare. Kingsbridge town square becomes a hotbed for sizzling food and funky music. The Kingsbridge Food & Music Festival is a colourful three-day event that continues to capture the imagination of both locals and visitors, and this year promises to be another corker! Staged at Newton Abbot Racecourse, Lemonfest is a two-day musical festival supported by some of the top DJs in Europe. Definitely one for all you ravers who get to choose from six different music stages. Tickets now on sale. Bradninch Music Festival embraces all genres of music and has a committee particularly keen to showcase local singers and songwriters from East Devon. Expect a heady couple of days full of pub gigs, street entertainment, poetry, art, music workshops, a chillout zone, and lots of creative antics. The tenth Crediton Food & Drink Festival is all set to serve up a smorgasbord of local delicacies and tempting tipples, plus live music and cutting-edge food demos. Saturday’s opening ceremony will be signalled by fanfare and trumpeting, then it’s indulgence and merriment from there on in! Once again, Chagstock is all set to entertain its festival goers with a pulsating line-up of bands and solo artists. This year’s theme is ‘space and sci-fi’, so expect a ‘cosmic’ experience high up on Whiddon Down. Music lovers travel from far and wide to enjoy the Teignmouth Folk Festival. This intimate gathering in one of Devon’s most iconic seaside towns offers up concerts and performances, workshops, dance acts, plus the opportunity to have ‘meet and greet’ with the various artists. 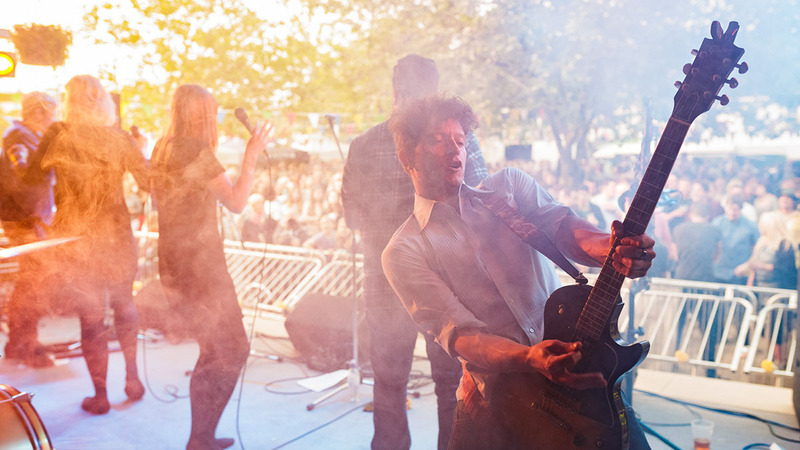 Let’s Rock Exeter is a retro festival that attracts some of the most iconic acts of yesteryear to the main stage at Powderham Castle. Get your ripped jeans and baggy Tees on and enjoy a blast from the past with a line-up that includes the likes of OMD, Sister Sledge, Aswad and Fuzzbox. A feast of classical music served up on the Jurassic Coast, The Budleigh Music Festival has an excited and packed programme of lunchtime and evening concerts from piano sonatas to string quartets – music to stir the soul. The abbey’s tranquil grounds provide an idyllic setting for this summer food fair. Two grand marquees and a live demo stand will help stage the various activities throughout the day, plus there will be a performance from classical singer, Pippa Langhorne. Buckfast Abbey is surrounded by woodland and meadows and is known for its many grazing deer. To mark its 70th birthday, the Summer School is putting on a bumper four-week programme full of acclaimed artists. You can also enjoy workshops and masterclasses, coaching and concerts, premieres, and exciting, new collaborations, all surrounded by beautiful South Devon countryside. The origins of Sidmouth Folk Week run all the way back to 1955, and now attracts tens of thousands of visitors and more than 700 acts. From established stars to emerging talent, this week-long festival is a mecca for lovers of folk music. Expect a pulsating line-up of musical acts across all six stages at this year’s Beautiful Days. You’ll also find a children’s zone, a walkabout stage, art installations, comedy, theatre, food and crafts stalls, a healing area and outside bars that open ‘till late. Nourish Festival is a celebration of food, craft and music set in the heart of the moorland town of Bovey Tracey. Some of the region’s top chefs will be showcasing their knowledge and expertise, plus there’ll be live musical performances and a craft fair displaying the work of local artisans. Abbfest is a weekend festival full of live music, local cider, ale, foods and crafts in the beautiful countryside setting around Denbury Down. Meet some of the area’s most talented artisans and producers, learn about their skills, and sample their wares. Taste of the Teign is a showcase for the food, drink and hospitality that thrives along the Teign Estuary. This nine-day event puts the spotlight on local food culture and the history and traditions that have supported it. Now in its sixth year, Powderham Food Festival has well and truly established itself on the West Country festival scene and is a date for any foodie’s diary. Powderham Castle makes for an impressive backdrop to this scrumptious event. This year, the festival is embracing all that is homegrown and is hoping to inspire families to have a go for themselves. The seaside village of Beer is preparing to host its 21st Rhythm ‘n’ Blues festival, with a tantalizing line-up that includes Del Bromham’s Blues Devils, Grizzly Rhys Morgan, and The Monster Jam. The Two Moors Festival is a nationally renowned showcase for rural music, attracting world-class artists to its stunning locations. Throughout the month of October, churches, halls and country houses across 1,200 square miles of Dartmoor and Exmoor will be staging inspirational performances, talks, exhibitions, school workshops and masterclasses in celebration of these two cherished wildernesses. Heralded as ‘one of the top ten food festivals in the UK’, Dartmouth Food Festival is considered a must for all gourmets. Indulge in some local taste sensations, peruse the one hundred plus exhibitors, and learn from the very best chefs in the UK during this culinary extravaganza, hosted by one of Devon’s most historic maritime towns. With a whole host of fantastic festivals, as well as stunning beaches, miles of South West Coast Path and Dartmoor National Park to explore, there are so many reasons to visit Devon this summer. Take a look at our impressive list of holiday cottages throughout Devon.